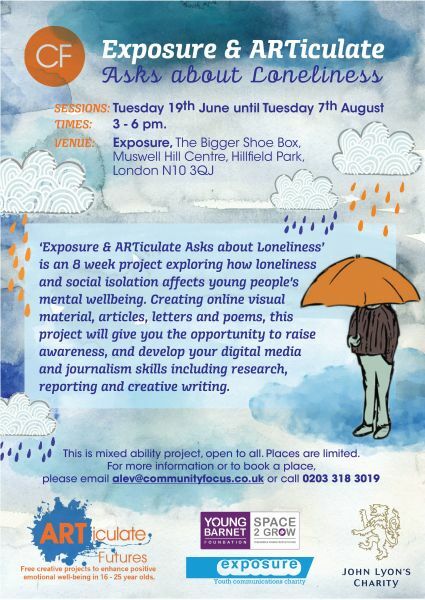 ARTiculate is an empowering 3-year programme using creativity to enhance and celebrate the positive mental health and emotional well-being of 16 – 25 year olds in Barnet. ARTiculate is a self-referral project which gives groups of young people the opportunity to learn new skills over 8 art-sessions. Each session lasts 2-3 hours and can be delivered flexibly to the young people’s needs, e.g. one evening a week for 8 weeks or over one week (during half-term). These art projects happen across the borough of Barnet, e.g. in youth clubs, community centres and libraries. Some of our courses are accredited, others progressional, whilst many are there for you to participate in regardless. Community Focus, Friary House, Friary Park, Friary Road, Friern Barnet, London, N20 0NR. Alternatively professionals, e.g. GP’s, teachers, CAMHS workers, CPN’s, social workers and youth workers, can refer a young person into ARTiculate. Please contact Alev for the separate Referral Form.